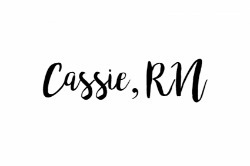 Long before I ever dreamed up the possibility of the letters RN following my name, I was a little girl with another dream. A dream rooted deeply in personal experience and passion driven by frustration. 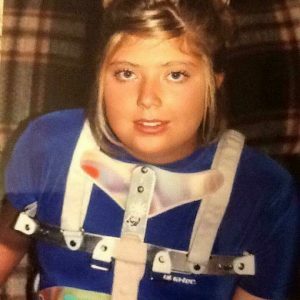 Before I began chasing this dream, I dreamed of becoming a pediatric orthopedist because this girl was on a mission to fight the object that angered me most: my back brace. I was prescribed a back brace for my kyphosis in the 7th grade. I remember I hated my brace, but not more than my momma hated it for me. 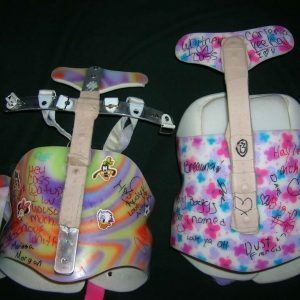 I recall being an adolescent, desperate to fit in, which was sometimes hard because my back brace literally stuck out 3-4 inches right between my shoulder blades. Once, in the heat of an argument, my sister called me ugly because of my brace (don’t worry, we’re cool now). And another time, I remember my dad threatening to ground me because I hadn’t worn my brace in a couple hours (He was the compliancy police when it came to that back brace). I remember a kid in my class that used my back brace as a set of drums with his pencils when his assigned seat was behind mine. And I remember my little cousin being born and not being able to snuggle him as a sweet baby because the plaster I was encased in was the very opposite of gentle. I’ll never forget my collection of maternity jeans as a 7th grader because the elastic fit over my brace better. Or the time I woke up in the middle of the night to rip my brace off because I couldn’t sleep comfortably with it on. But when I look back at my time in a back brace, I don’t remember those challenges as specifically as you would think I would. In fact, I really have to make myself dig deep and get to the hard stuff to reflect on those moments. Instead, I remember grace. Sweet, beautiful, unmerited grace that I didn’t deserve. At the time, I don’t think I fully understood the impact that brace would have on me. To this day, not a day goes by that it or my scoliosis doesn’t cross my mind. At the time, I don’t think I could have grasped the platform that my brace was going to have on my future. I don’t think I realized that I would one day use it to speak to groups of high schoolers about pursuing careers in medicine and leadership. I never could have predicted that wearing that brace for two years would lead me to lifetime in healthcare. You see, that’s how God’s grace works sometimes. During the challenge, we don’t always see the way the Lord is working in us. We only see the hard parts, the parts that make us go home and cry and tear off the orthotic devices our dad says we have to wear. While the Lord is working on us, we only see the construction zone that looks more like demolition. And we forget to read the sign that says “Please excuse our mess, construction in progress”. But friend, even when it’s messy and challenging, and just plain miserable, God’s grace is still in action. He’s cooking up something amazing for us during our time of weakness. I have to believe that those two years in a brace were shaping more than just my spine. Those years spent wrapped in shiny metal and hard plaster would soften my heart for my future patients. 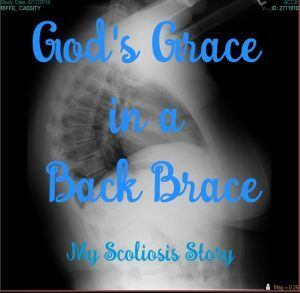 I saw God’s Grace in a back brace. I still see it every day in my life, how He challenged me for two years to mold me into the person I am today. I saw God’s Grace in a back brace with the outpouring of love and support from a classroom full of preteens and my compassionate teachers. I saw God’s Grace in a back brace at every single doctor’s appointment when I met children with diagnoses that had as many words as sentences. I see God’s Grace in a back brace when I can look back at a difficult time in my life and use it to help others and glorify our Lord. This is exactly what grace is about. In fact, the Lord Jesus teaches about grace in one of my favorite scripture: “But he said to me, “My grace is sufficient for you, for my power is made perfect in weakness.” Therefore I will boast all the more gladly about my weaknesses, so that Christ’s power may rest on me.” 2 Corinthians 12:9 Check out those words in red, y’all. 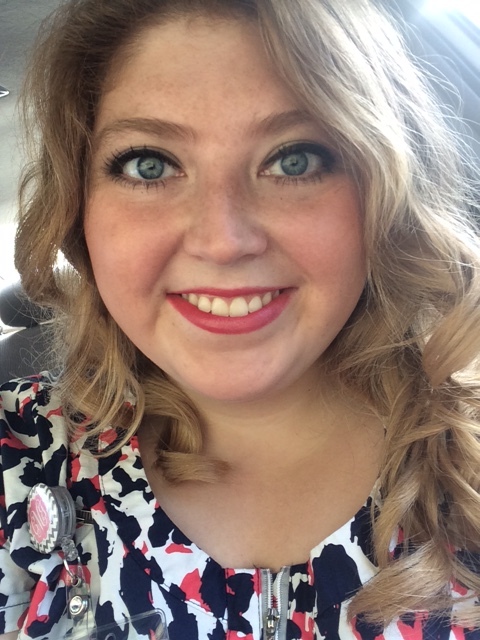 God’s grace was exemplified during my time in a back brace. Probably the weakest part of my life as an adolescent, but I will boast all the more gladly about that weakness so our Lord can be glorified by it. And that’s God’s Grace in a Back Brace.